This masterpiece has been stolen not once, but twice in the last twenty-five years. The owner, a member of Britain's Parliament, was targeted by the IRA, who broke into his estate in 1974 and took a total of nineteen paintings. It was recovered a week later, having sustained only minor damage. In 1986, the Dublin underworld stole the painting. Only after more than seven years of secret negotiations and international detective work was the painting recovered. Hopefully Vermeer's The Concert , recently stolen from the Gardner Museum in Boston, will be recovered in a similar manner. 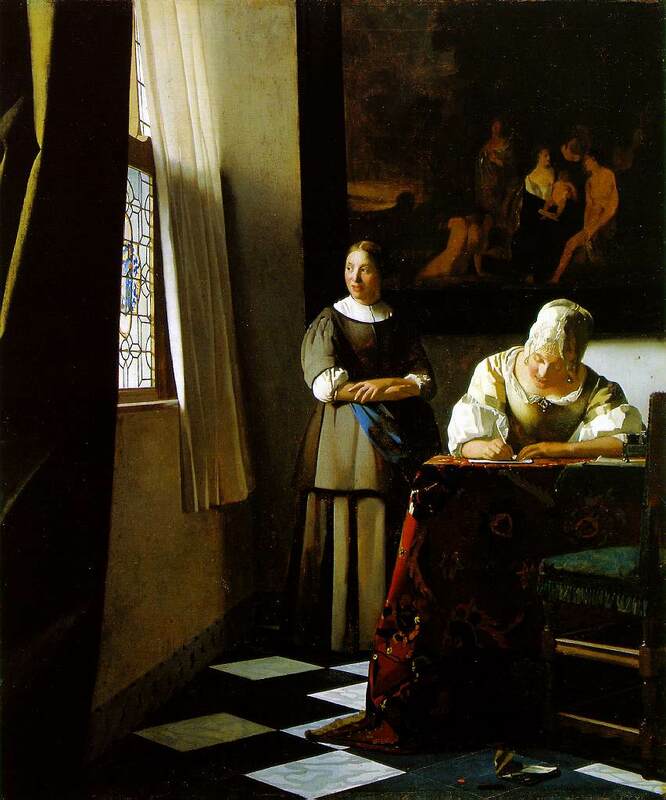 Lady Writing a Letter with Her Maid exemplifies Vermeer's essential theme of revealing the universal within the domain of the commonplace. By avoiding anecdote, by not relating actions to specific situations, he attained a sense of timelessness in his work. The representation of universal truths was achieved by eliminating incidental objects and through subtle manipulation of light, color and perspective. The canvas presents a deceptively simple composition. The placid scene with its muted colors suggests no activity or hint of interruption. Powerful verticals and horizontals in the composition, particularly the heavy black frame of the background painting, establish a confining backdrop that contributes to the restrained mood. The composition is activated by the strong contrast between the two figures. The firm stance of the statuesque maid acts as a counterweight to the lively mistress intent on writing her letter. The maid's gravity is emphasized by her central position in the composition. The left upright of the picture frame anchors her in place while the regular folds of her clothing sustain the effect down to the floor. In contrast, the mistress inclines dynamically on her left forearm. Her compositional placement thrusts her against the compressed space on the right side of the canvas. Strong light outlines the writing arm against the shaded wall, reflecting in angular planes from the blouse that contrast abruptly with the regimented folds of the maid's costume. The mistress is painted in precise, meticulous strokes as opposed to the broad handling of the brush used to depict the maid. The figures, although distinct individuals, are joined by perspective. Lines from the upper and lower window frames proceed across the folded arms and lighted forehead of the maid, extending to a vanishing point in the left eye of the mistress. The viewer's eye is lead first to the maid, then on to the mistress as the focal point of the painting. Vermeer shuns direct narrative content, instead furnishing hints and allusions in order to avoid an anecdotal presentation. The crumpled letter on the floor in the right foreground is a clue to the missive the mistress is composing. The red wax seal, rediscovered only recently during a 1974 cleaning, indicates the crumpled letter was received, rather than being a discarded draft of the letter now being composed. Since letters were prized in the 17th century, it must have been thrown aside in anger. This explains the vehement energy being devoted to the composition of the response. Another hint is provided in the large background painting, The Finding of Moses . Contemporary interpretation of this story equated it with God's ability to conciliate opposing factions. These allusions have led critics to construe Vermeer's theme as the need to achieve reconciliation, through individual effort and with faith in God's divine plan. This spiritual reconciliation will lead to the serenity personified in the figure of the maid.